There's loads of important information and skills to pick up in this fabulous pursuit and over the next few paragraphs I'll highlight a few of the more essential ones. Ownership of a salmon fly rod does not assure success in this sport so double check your own form and make sure you're not too far away from what you're about to read. The first important thing to look at is how your physical approach to a pool is conducted. I've witnessed many salmon fishers over the decades crunching right up the riverside gravel to the neck of the pool to then fish back down through the pool hoping for success. Give a salmon pool a wide berth so as not to spook and move away any closer lying salmon. If you're wading in any salmon pool only do so to the minimum depth you need to give yourself enough 'anchor point' space for your Spey cast or to give you the often unthought of optimal angle positioning for fly speed control. Far too many anglers wade far too deep without considering the above relevant points with only thoughts of presenting their fly across the pool as far as possible. This leads me to another fact that distance casting is meaningless if your salmon fly is not under full control. There's many 'casters' who look amazing with a double handed fly rod in their hands and then there's the 'fishers' who will consistently come down through a pool behind them and hook a couple of fish for fun. I've seen this so many times so enjoy your casting but get your thoughts 'sub surface' as quickly as you can as that is what truly matters. Make sure you're also seperating each swing of your salmon fly by approximately 3 feet as 'less is definitely more' when it comes to showing a salmon your fly. A predatory reaction from a salmon is much more likely if a salmon only gets a brief look at the fly as you'll very seldom be able to pester a fish to take. On the bigger Scottish rivers this 3 ft spacing will also significantly increase your water covereage while looking for that taking fish over the full course of the fishing day. When you're fly fishing down through a pool the mantra for your head should be 'do nothing' so if you get a nudge on the fly and these are the words in your head then there is a great chance you'll not react initially to the take and simply 'no nothing'. This is so important that you let the take develop and the salmon turn away to commence a steady draw of line off your fly reel. The initial take from a salmon can often be very gentle like that of a trout so don't blame it on a trout if you've reacted too quickly to a salmon! If your pool approach is good and you haven't gone right into the pool to your wader's full limit and your fly swing spacings are properly measured then the next very important point is how to react to the take from a salmon. This important topic requires a bit of logical composure so I'll not rush my personal view of this and will explain it in more detail as most salmon fishers are pre-programmed for disaster before they even reach the salmon river. Have you ever heard the statement 'just lift into it' as the advice given after the salmon has taken and turned on your fly ? This is the worst thing you could ever do when a fish takes as you're then relying on a lightly set fly reel clutch and the soft action of your fly rod to set the hook properly. Even you're using super sharp fine wire hooks and the initial micro hold is sitting in some of the softer tissue within the salmon's mouth then you might get lucky and get away with this 'traditionally taught' salmon fly hook setting approach. Getting to the 'sub surface cooperation' point during most salmon fishing days usually requires a fair bit of effort so any opportunity to hook a fish should be capitalised on and not squandered. After you've 'not' reacted to the first series of tugs and allowed the extra several seconds for the salmon to turn and head back to its lie simply clamp the fly reel face and let everything tighten with the rod tip down only for 2 or 3 additional seconds. If you time this correctly you'll momentarily feel the weight of the fish and the hook will be set and the fish yours. There's nothing worse than the 'fix' of adrenalin created from the take from a salmon to be then followed by the dreadful feeling of a slack line so don't put yourself in that position. 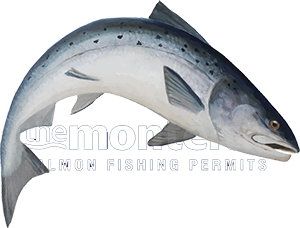 Any hook point logically requires sufficient pressure to be set properly and if you don't do that a salmon is a true master at shaking out unwanted objects from it mouth and will usually achieve this within the first 30 seconds of contact with a partially set salmon fly hook.